Two star Arab correspondents told a captive audience about their adventures in various war zones, with one recounting and showing how her job almost cost her her life. 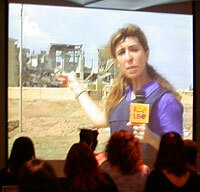 Nakhoul ran footage of the event during a panel on women’s role in families, education, media and culture as part of the Arab Women’s Forum on Armed Conflicts in Beirut almost a year after the U.S.-led war on Iraq began. She told of her most harrowing experience as Reuters bureau chief in the Gulf assigned to cover the war on Iraq. Most gripping were scenes of her being carried out bloodied and half-conscious into a car and onto one of many hospitals in and outside Iraq where she was treated and operated for wounds sustained by tank shells and shrapnel. Her colleague Taras Protsyuk wasn’t so lucky and died en route to hospital. “All I remember after that was the sensation of my face burning and I felt my head bleeding and a terrible pain,” she said, adding that journalists screamed for generators to be turned on to bring down the dead and wounded from their 15th floor perch at the Palestine Hotel where they had set up their bureaus. Nakhoul underwent surgery more than once — a piece of shrapnel is still lodged in her brain — and feared losing her sight from the severe bleeding. Aware of the dangers facing war coverage, the experienced Reuters news agency veteran never thought she’d become the story. “In an instant I was no longer the journalist who had gone to cover the war and convey people’s suffering but one of its victims fighting for my life,” she said. She recounted in vivid detail the painful scenes of destruction and anguish in hospitals desperately trying to cope with a steady influx of dead and wounded amid the chaos, shortages and dangers. It was not the first war she had covered — she witnessed the previous Gulf war and experienced Lebanon’s civil strife — but said the war in Iraq would leave indelible marks because of its victims and as a result of the lethal weapons used. “We knew this war would re-write the region’s history and we knew we were in its midst witnessing it, which is why we felt it our duty to go beyond reporting on military advances and shelling and to conveying the conflict’s effects on people,” she said. Also braving bullets, shells, snipers and countless dangers is Tania Mehanna, the itinerant war correspondent for Lebanon’s LBCI TV who shared the panel with Nakhoul. She debunked myths that war correspondents were hardened men, adding that the worst reporters were ones who were heartless and with no compassion for others. “Wars aren’t just military decisions made by executives behind desks or some military commanders behind tanks and guns; they also have effects on people’s lives and carry human tragedy,” she argued, making her case with video footage of her hair-raising adventures. Mehanna has covered wars for 16 years in Afghanistan, Iraq, Pakistan and reported on the liberation of South Lebanon. In a bid to create awareness among Lebanon’s southern population, she has also reported on the dangers of land mines left behind by Israeli troops and their Lebanese proxies. 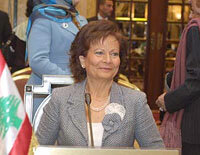 The women’s forum March 7-8, 2004 at which both journalists spoke was hosted by Lebanese First Lady Andrée Lahoud and grouped the first ladies of Egypt, Syria, Jordan, Sudan and Bahrain. The event included sessions on legislation, health issues, peace and justice and armed conflicts’ impact on society, the economy and politics. Chairing the panel on media and culture was Magda Abu-Fadil, director of the Institute for Professional Journalists at LAU, who also edited the forum’s daily tri-lingual newsletter.